Skunk Hollow is a colorful (and historical) name for the Oxford Industrial district of St. Louis Park. 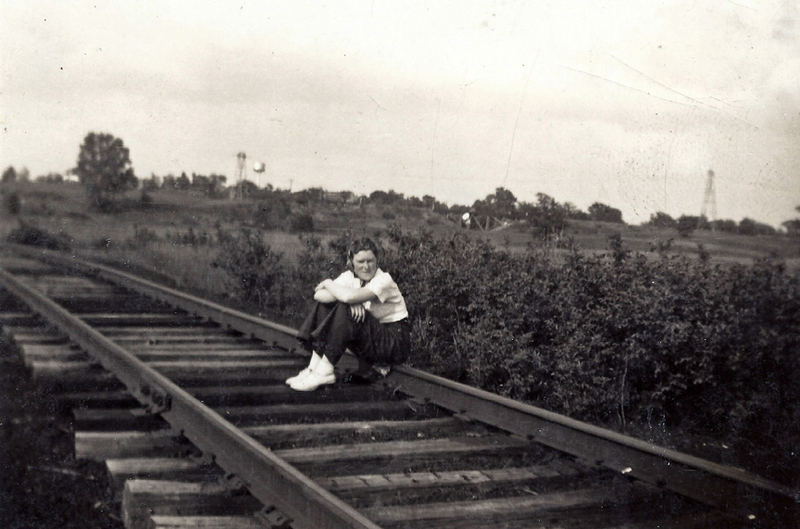 It is located north of Methodist Hospital, east of Meadowbrook Road, south of the old Milwaukee Road/Mpls. and St. Louis tracks and west of the old Dan Patch tracks. Originally the only way to get in or out of Skunk Hollow was under the railroad bridge that spans Cambridge Ave. Built in 1915 for the Dan Patch railroad, the road under the bridge was only 16 feet wide, causing trouble as the area grew. 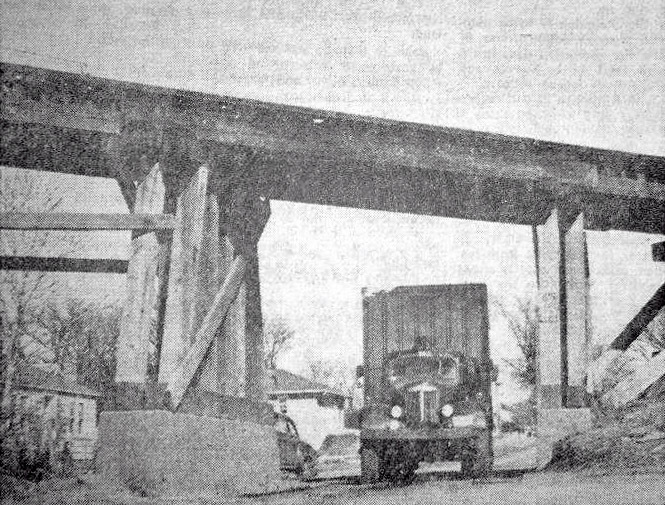 In 1957 the Minneapolis, Northfield and Southern Railroad (formerly the Dan Patch) rebuilt the bridge to a width of 30 feet, at a cost of about $11,000. At the end of the 19th Century, several large homes were built in the area that would become Skunk Hollow. They have all been removed, with one mysterious exception. There are two duplexes on Cambridge Ave. as one enters the area from the east. These two buildings were built in 1898 according to the city, a good 50 years before the industrial buildings in Skunk Hollow were conceived of. Legend has it that they gave Skunk Hollow their name, after families of skunks were found living in them. Perhaps they were the “railroad bunk houses” enumerated in the 1920 Census, one housing nine men and the other, six – all railroad section workers and all native Italians. 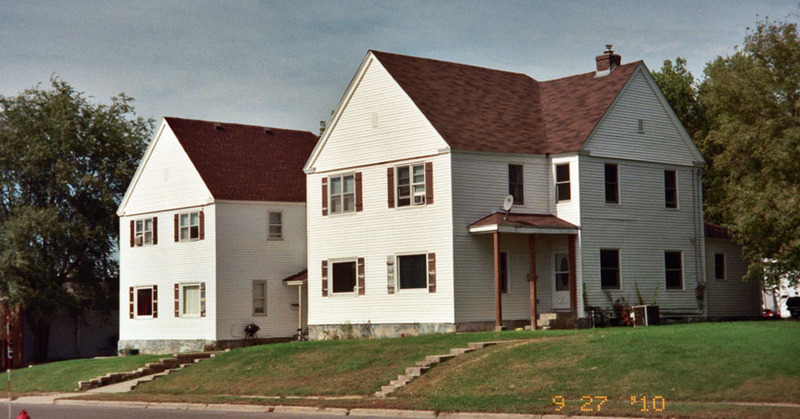 One oldtimer remembers that “Grampa” Smith lived in the first section of the first house near the tracks. He had a white horse which he used to plow snow from the sidewalks in the 1920s. Today the buildings are known as Murphy’s Ridge Townhomes and consist of four condos. We know not where the Murphy’s Ridge name came from. The two big houses were there, of course, with a pasture across the road and nothing but open space to the west. Much of it was swamp, with coots swimming in the open water. The main attraction to the guys in the hood was a stretch of Minnehaha Creek that ran west to east, up close to the Oak Hill end. That’s where many of us learned how to swim. The Creek in this section was flanked up closed by a RR spur track. The Creek was only waist deep along this stretch but some of the more imaginative guys figured out that by damming the Creek, the water level got close to shoulder high. Great for swimming, but it would also flood the RR tracks. The RR people would then send a crew to destroy the dam, after which the rebuilding activity would commence again. I have a particularly vivid recall of an incident that occurred in late summer when a group of the guys were swimming in the Creek and lo and behold, around a bend on the tracks comes this steam locomotive, kinda quiet and sneaky like, and as he got close to the guys swimming, he opened a steam valve that clouded the Creek with live steam. Panicsville!! I can still see those knobby-kneed, bandy-legged, bare-assed guys explode from the water and charge up the opposite bank. That’s how I remember Skunk Hollow. Thanks, Al, for your memories! Marie Hartmann “looking east from creek.” Photo taken in 1937. The swamp at one time was offered for sale (and refused) for $100. Many of the buildings in Skunk Hollow were built by a man named Allen Garrison. Garrison must have had quite a bit of vision and optimism that the project would work. 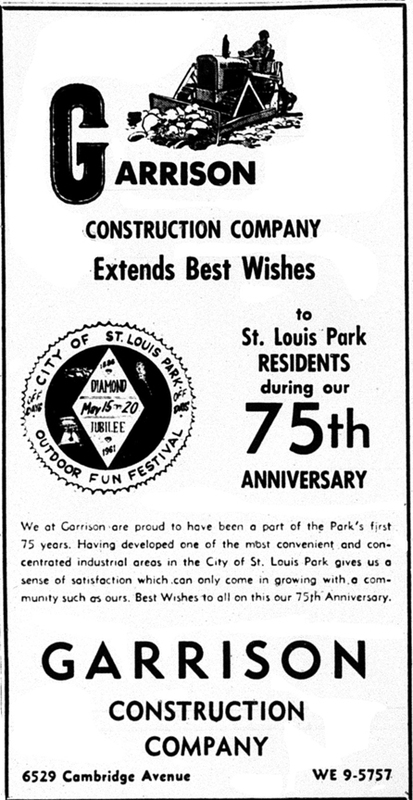 He built many buildings in the Park in the 1950s, after the Korean War building supply embargo ended and in the midst of a booming St. Louis Park hungry for space to launch businesses. We hear that as soon as one of his buildings was finished, Garrison would throw a wild party for everyone – electricians, HVAC men, etc. – who worked on it. In 1959 Garrison donated nearly half a mile of right of way to the City for a “projected industrial highway… The crossroads would be comprised of the proposed Oxford Street Extended and its intersection with the proposed southern extension of Louisiana Avenue.” Not sure whether it was Louisiana or Oxford that was to be the “industrial highway,” but Louisiana was extended to Excelsior Blvd. in about 1972. At the end of Cambridge, take a right at Edgewood and you’ll come to a building that was originally the Cambridge Café. In 1967, this was the odd location of the “TV’s Hullaballoo Teen Scene” night club, evidently a franchise owned by a Barbara Jacoby. That short-lived endeavor was replaced by the “Purple Cigar,” owned by Arnie Sagarski. Despite the fact that big-time local bands played there, it too ended quickly, in about 1968. More information about these fun spots can be found Here. Travel down Edgewood to Oxford and take a look to your right and you’ll see a steep hill with railroad tracks at the top. We think that before the railroad came, the hill was not so steep, Oxford went through, and that’s how the Monitor houses, originally built in the swamp in the 1890s, were hauled to higher ground. Monitor houses were 12 homes built by the Monitor Drill Co., probably for its managers. There are four left, on Colorado Ave. between Oxford and Goodrich. There are many industrial buildings on Oxford, on either side of Louisiana Ave. The City’s new municipal building is located west of Louisiana. And at the end of Oxford, Meadowbrook Road turns to the left to meet up with Excelsior Blvd. We hope you’ve enjoyed your tour of Skunk Hollow. If you have any additional information, corrections, or photographs, please contact us. Many thanks to Bill and John Smith for their stories.